The RAT Modification Process is not just a simple case of adding Mods to the existing Amplifier. This is one reason why I don't do 'Kits'. With each Amp there is a pile of additional work required to get the Amp performing at it's optimum with maximum reliability. 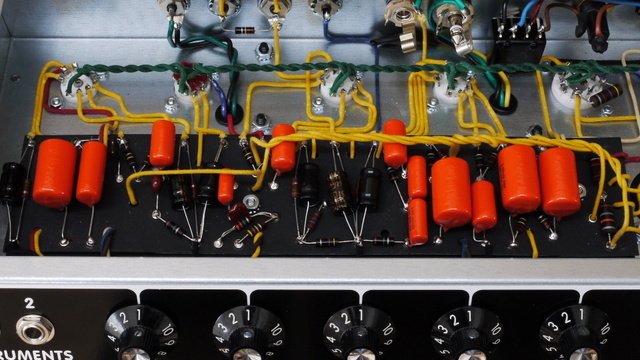 Factory production Amps are made to a 'Price' and with very few exceptions (Boutique Builders and Mesa Boogie), at least some 'Cost Cutting' shortcuts will have been applied, despite what the Manufacturer may say. From underrated components to the thickness of the wires, this 'Cost Cutting' goes right down to the amount of Solder used on the PCB. It's easy to understand why this is done, on a production run of 1000 Amps, if £10 can be saved on each Amp, that equals £10,000 more profit. 1. - Valves - This is where £££ can be saved on production costs - Fitting 'B Grade' Rubbish Valves (Usually Chinese in origin, but not always). There is no option here, if the Valves are poor quality, they must be replaced. I personally would rather pay more for an Amp knowing it has a quality set of Valves fitted. 2. - PCB Soldering is another area which severely effects reliability. Most large factory's use a 'Wave (Flow) Solder Machine'. It's a simple, effective way to solder a complete PCB assembly in seconds. The major benefits are that it's quick -and- uses the absolute minimum Solder required to make the connection (joint) between a component and the PCB Track. Solder is VERY expensive. This is great for an iPad or Mobile Phone - But BAD news for a Valve Amp where there are High Voltages - High Current - High Physical Stress Points and High Temperature's, all of which will destroy an inadequate Solder joint (this applies mainly to Single-Sided PCBs). The trick here is to identify potentially weak joints and reinforce them. It has to be done or the Amp will fail in a very short time period. This should be done at the Factory but 9 times out of 10 it is not. The worst example of this that I have ever seen is in the Marshall C5 Head and Combo. Power Resistor 'R6' is so badly Soldered (on all C5 Amps) that you can easily pull it out of the PCB with your Fingers, failure of this part equals a DEAD Amp. 3. - Capacitors - In all Amps, there are some Very important Capacitors (Caps). These are the 'Signal Chain' Caps. In a small 5w single channel Amp there are usually about 4 of them. High Quality Caps, like 'Orange Drops' cost about 80p each. Caps that will 'Do the Job' cost about 1p each. You can guess which Caps a Production Amp uses. If just one or two 'Cheapo' Caps are replaced in the Amp, there will be little or no change in the final sound but if ALL of the 'Cheapo' Caps are replaced there will be a noticeable improvement in the Amp's 'Clarity'. This is a good example of how about £3 can be saved on just 4 small components. 4. - Resistors - Are rated in Ohms (Resistance) and Power (Watts). There are also many different types of Resistors - Carbon, Metal Film, Wire Wound, Ceramic and more. The Price of the Component (like everything else) varies with Quality and Type. Generally speaking, a Resistor should be the 'Correct Type -and- Double Rated' - if a '2 watt wire wound' Resistor is needed then a '4 watt wire wound' part should be fitted. This is not the case in production Amps where if a '2 watt wire wound' part is needed then a '2 watt carbon film (much cheaper)' part is fitted. This is OK for awhile but the Resistor will eventually fail as it is running at it's maximum rating all of the time. These Resistors need to be replaced or the Amp will fail. Result - A Dull, Unreliable Amp - due to Poor Valves, Minimum Solder, Cheapo Caps and underrated Resistors. Using just these 4 items as an example, on a small Amp, the Factory can save about £10+ in production costs on each Amp. The above is just the tip of the Iceberg - Further savings can be made by using MDF for the Cabinet, Thin Steel for the Chassis, Small Transformers, Poor Quality Switches, Knobs, Pots and Sockets. The List goes on forever but should give you a good idea how most Production Amps can be improved with the correct Modifications.